PRINCETON, N.J. — Historic Princeton University has opened a prayer area for Hindu students, according to reports, complete with a temple for the Hindu goddess Saraswati. The university currently has a chapel that is used for Christian services, a Muslim prayer room, a Center for Jewish Life and an interfaith prayer room. 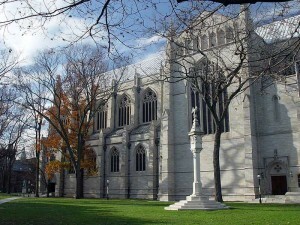 Princeton University was founded in the late 1700’s by four Christian pastors, and is stated to have been one of the results of the Great Awakening. It was originally intended to open as a seminary, but rather was established as a college of liberal arts and sciences. Preacher Jonathan Edwards, known for his sermon “Sinners in the Hands of an Angry God,” served as the university’s third president. As previously reported, the Universal Society of Hinduism is likewise seeking designated Hindu prayer rooms at airports worldwide, such as John F. Kennedy International Airport in New York and Frankfurt Airport in Germany. “Prayer/worship to god was highly important in Hinduism—the oldest and third largest religion of the world with about one billion adherents—and it would be great to have a Hindu prayer service or ‘Hindu Prayer Room’ at airports so that Hindu passengers did not miss their daily worship rituals/rites while travelling through, which might include recitation of texts, repetition of mantras and dhayan (meditation),” stated President Rajan Zed. “Hindus would appreciate if this ‘Hindu Prayer Room’ had murtis (statues) of popular deities, copies of sacred scriptures, a traditional bell and recorded devotional music; and once-a-week kirtan and arti session was held in it,” he said.